Native Custom Stone, a faux stone manufacturer in Dawsonville, GA, announced that their newest stone panel system, GO-Stone™, will now be available to order online at The Home Depot. Native Custom Stone, a faux stone manufacturer in Dawsonville, GA, announced that their newest stone panel system, GO-Stone™, will now be available to order online at The Home Depot. This new eco-friendly product is specifically engineered for use on interior DIY projects such as backsplashes in kitchens and bathrooms, as well as accent walls and fireplaces. This specially designed stone panel system is now available online and will soon be available in select locations in the Atlanta market. GO-Stone™ is available online, it is packaged in multiples of 5 square feet, the corners are packaged in multiples of 4 linear feet. The stone is manufactured using a special blend of crumbed rubber, making it an eco-friendly solution. For each five square feet of GO-Stone™ manufactured, one twelve pound tire is stopped from being thrown into our landfills. In the United States over 200 million tires are thrown out annually. 78% of these tires are either dumped in a landfill, or illegally dumped elsewhere. Native Custom Stone is trying to reduce the amount of unnecessary waste, all while creating a product that will add value to your home. Utilizing the latest in crumb rubber technology Native Custom Stone is able to produce a product that is extremely light weight, this eliminates the need for mortar, sand, and a mason. GO-Stone can be installed using vertical tile adhesive, and anyone can do it! This new stone panel system will be available in 3 different colors and have accessories to compliment such as electrical surrounds and water table. Native Custom Stone has distributors all over the country, but having their product so readily available in one of the largest home improvement stores makes it even easier for those looking to refresh their home’s interior. The GO-Stone™ panels are sold in premeasured amounts, so customers can choose exactly the amount they need, reducing waste, and making it easy to haul. GO-Stone™ panels are very simple to install, and all of the materials needed for installation are available at The Home Depot, making it a one-stop-shop project. Native Custom Stone is a premier manufactured stone company located at 236 Hightower Parkway in Dawsonville, GA. 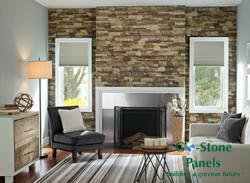 They have distributors all across the United States for their many faux stone veneers and panels. GO-Stone™ will be available exclusively at Home Depot stores nationwide. To find out more about GO-Stone™ or any of Native Custom Stone’s manufactured stone products they can be reached by phone at (888) 823-0745 or by email. Website and marketing for Native Custom Stone is provided by Atlanta SEO Company, Interactive Search Marketing.